In life there are many ideals, causes, and interests that one can have a true passion for. However, the intensity of one’s passion for something can only be measured by how far he or she takes that passion and makes it a central focus of life. Nowadays, with the growth of digital media and never ending exchange of personal opinion, there is a lot one can latch onto and develop a genuine passion for. Be it politics, professional sports, or even beer; life can take on a whole new meaning when you just have a passion that drives you forward. When it comes to beer, your average American will assume that a passion for beer means getting plastered on cheap beer and living to wake up the next morning and do the same thing the next night. Though for a select group of people being passionate about beer takes on a whole different meaning and has the possibility to enhance one’s appreciation for food, friendship, and many other facets of life. One of the distinguishing factors between the two aforementioned perspectives on having a passion for beer is flavor. On one hand those who enjoy drinking copious amounts of cheap beer rarely think twice about what the beer they are imbibing tastes like. While on the other hand, those who gain an appreciation of many facets of life through beer are those who take the time to seek out and choose beers that are not only drinkable, but also have complex flavors that can cause one to take a second and decipher the contents of his or her glass. With world beer sales being dominated by bland mass-produced lagers, beer with actual flavor struggles to make itself known as what beer truly should be. As such, developing a true passion for beer takes hard work and dedication to a craft not appreciated as much as it deserves to be. The category of beers that includes those who are dedicated to full flavored beer has been appropriately named “craft beer”. There are two general groups of people spreading their passion for beer, the brewers and the drinkers. The brewers brew beer for quality rather than quantity, all while developing their craft with new brewing techniques and the revival of old ones. Drinkers of craft beer not only support the brewers through the purchase of their beers, but spread the word of full flavored beer to as many people as possible. One important factor that separates the brewers of craft beer from those that brew mass produced beers is their camaraderie with those that drink their beers. Meaning, the drinkers can interact with the brewers both in person and online, talking about craft beer and the growth of the segment of beer sales that they represent. Most passions are sparked by a singular event or experience that causes one to rethink his or her previous impressions of something and realize the value and benefit in exploring the object of their new found interest on a deeper level. However, one should keep in mind that a genuine and driving passion for anything takes time and effort to develop, and can take on various forms before one can hone in on what makes their passion for that object or cause unique. When it comes to craft beer the experience usually comes from tasting a beer that causes one to have an epiphany and say “Wow I never knew beer could taste like that.” That quote could take different forms based on which beers the person saying it had been drinking before having their craft beer epiphany. However, most people are hooked from then on and never go back to drinking mass-marketed light lagers etc. again. One challenge when exploring the plethora of craft beer available nowadays is where to start. Since having my epiphany I have heard many suggestions of how to go about entering the world of craft beer and developing your “beer palate”. Hence, future posts will be dedicated to spelling out what I feel are the best ways to develop one’s personal preferences within craft beer. Ever since beginning its assent to world wide recognition in the 1980s the American craft beer community has overcome many challenging obstacles. In order to get the ball rolling for the brewing of full flavored beer, the pioneers of craft beer fought to have legislation passed that would allow fledgling brewers to brew legally both at home and in brewpubs for the fans of their beers. Over time most Americans have lost sight of America’s rich brewing history. One reason why that happened is because of Prohibition. Before Prohibition there were hundreds if not thousands of small breweries who brewed small batches of beer for those in their city and or region. However, the overwhelming majority of those breweries closed up shop either during Prohibition or shortly after its repeal. Yet another reason for the lack of awareness of what beer is supposed to taste like is the marketing campaigns and market influence of the “big three” i.e. Budweiser, Miller, and Coors. Every year those three giants of the brewing industry spend millions of dollars on attempting to convince Americans (and the world) that their mass-produced lagers have actual flavor appeal. As such, a set of challenges has been placed on craft brewers that continues to evolve over time. Without going into too much detail at this point one of the challenges being fought is the following. Store shelves in supermarkets and liquor stores are commonly arranged so that the beers brewed and distributed by Budweiser, Miller, and Coors are in clear view of customers. As with the other challenges faced by craft brewers, considerable success has been made with the aforementioned challenge. For example, supermarket chains such as Whole Foods have created sections devoted to selling craft beer. 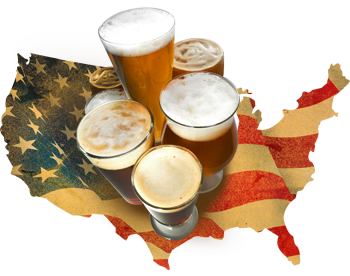 In addition, stores have open all over America that focus on selling American and international craft beers. I therefore believe that an important part of developing a passion for craft beer is both the knowledge of its history and the challenges faced my today’s craft brewers. Over the past 30 years over 1500 craft breweries of all sizes have opened all over North America and along with it the number of great beers available to passionate beer drinkers has helped shift the reputation of American beer from only brewing bland mass-produced lagers to being a producer of beers that brewers from other major beer producing countries look to emulate and gain inspiration from. A cornerstone of the success of any country producing craft beer is a culture that brings together the brewers and drinkers of the the beers that are constantly being released by its breweries for public consumption. While some may say that Americans are just mimicking the beer culture of countries such as Belgium, England, and Germany. Over the past 15 years the boom of new breweries that have opened and beers they have released has allowed for the development of a “craft beer revolution” consisting of bars dedicated to serving craft beer, giant beer festivals that take place yearly, and the beginnings of a grassroots movement dedicated to spreading the messages of American craft beer culture. Naturally, a successful and thriving revolution is driven by two important parties. The first being the masses of people that help set the trends that drive the growth of craft beer sales and inspire brewers to develop their craft by trying new brewing techniques and reviving old ones. Along with the masses are the individuals that represent what it means to have a passion for craft beer and serve as role models for brewers and beer enthusiasts in America and many other beer producing countries. Some of these individuals that I will be profiling in future posts in order to show youtheir influence on craft beer’s growth are the following. Greg Koch, CEO and co-founder of Stone Brewing Co. (Escondido, CA), Garrett Oliver, brewmaster of Brooklyn Brewery (Brooklyn, NY), and Charlie Papazian, president and founder of the Brewers Association (based in Boulder, CO). Each of the individuals profiled shares a common mission to spread the messages of craft beer, but also have made their own unique contributions that have made craft beer what it is today. An important characteristic of a driving passion is that it continuously develops and takes on different forms over time. Once one has discovered what drives his or her passion for craft beer there are various ways to maintain its growth and reach, two of which are the following. Since craft beer is a grassroots movement it requires its brewers and drinkers to serves as advocates for full flavored beer and spread the culture that surrounds it. Some craft beer advocates have chosen to take their advocacy beyond their local pubs and create blogs dedicated to spreading their take on what makes craft beer special. Next, many brewers got their brewing careers started by brewing their first batches in the privacy of their homes. Homebrewing allows craft beer enthusiasts to gain a deeper appreciation for the hard work that goes into the brewing of great beers and to brew beers that represent what they enjoy in the beers they drink. The above topics are just a glimpse at what will be included on this blog which aims to serve as a tool for craft beer drinkers to develop their passion for full flavored beers. The “craft beer revolution” has allowed many to improve their enjoyment of life and gain an understanding what makes a passion for beer special. As such, after reading this book hopefully those who have just discovered craft beer and those who have already caught on to its culture and become part of the revolution will have deeper appreciation for the world’s greatest beverage i.e. craft beer.